"You took it all on in great fun, you are already so missed"
It is with complete and utter devastation that we have to announce the sudden passing of our son, Henry Jacob Edward Westgard. Better known as Jacob or Jake. 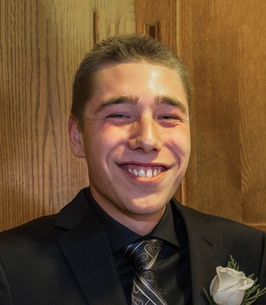 Jake was born and raised in Calgary and truly enjoyed life to the fullest. He had a magical way with children and he touched everyone who knew him. Jacob was pre-deceased by his grandmother Brenda Baerwald and cousin Sasha Baerwald. He is survived by his parents Shane and Sherri Westgard, sister Darcie (Logan), grandparents Bruce and Sylvia Westgard, Rodney Baerwald, as well as numerous aunts, uncles, and cousins. He will always be in our hearts. Memorial Service will be held at Calgary Church of Christ (4030 Maryvale Drive NE) on Saturday, October 27, 2018 at 11:00 am. If you wish, donations in memory of Jacob may be made to Calgary Health Trust in support of South Health Campus ICU (403) 943-0615. To view and share photos, condolences and stories of Jacob please visit www.choicememorial.com. Arrangements entrusted to the care of Choice Memorial Cremation & Funeral Services (403) 277-7343. We encourage you to share any memorable photos or stories about Henry "Jacob". All tributes placed on and purchased through this memorial website will remain on in perpetuity for future generations. Words fall far too short at this time. Just know that your profound pain and sense of loss is shared by so many. Perhaps more than you're aware of, and hopefully the despair is lessened because of this. Jake touched all he came across. He may be gone, but his light shall not be extinguished. There are no words we can find to properly to express this greatest of all tragedies. Please accept our thoughts and prayers that are with you through this. Sherri, Shane and Darcie. Sending you warm thoughts, prayers, love and light during this very dark time. My deepest and most sincere condolences on your loss of Jake. It is with sadness and sorrow that we write this note to you. Our deepest sympathies are with you in your time of great grief in the loss of your son, brother, and friend.May time help you to heal this wound in your hearts. Sherri, Shane, Darcy and Logan. Please accept my most profound, sincere and outmost condolences regarding the loss of your son, brother and friend. My heart and prayers go out to all of you. May time ease the pain and sorrow we all feel. My heart is broken, just as yours are. I am glad I had the opportunity to spend some time with Jake recently. He was always cheerful and willing to help. The children have lost a wonderful uncle. My condolences at this time of unbearable loss.